Ask most car buyers what’s holding them back from going electric and the answer will most commonly be two words: range anxiety. The fear of running out of juice on a journey is a huge barrier for motorists, not least because while there are currently more than 4400 charging stations across the country, there are more than twice that number of petrol stations, so there’s still plenty of work needed to bring the UK’s electric car infrastructure up to scratch. Of course, though, EV owners also have the option of charging at home. What you need, then, is an electric car that can go for hundreds of miles without needing recharging. Tesla already does well in this regard with its Model S saloon, with the P100D variant able to drive for up to 381 miles (officially). The problem, though, is that at £131,800 it’s also expensive, and therefore pitched against the Porsche Panamera Turbos and Mercedes-AMG S-Class Coupés of this world. The P100D is also capable of sprinting from 0-62mph in a staggering 2.4sec, but there may be some owners willing to sacrifice a drop in speed (and price) for more range. Enter this, then, the 100D. With an official range of 393 miles on a single charge, it’s the farthest-travelling electric car you can currently buy, and with prices starting from £90,000, it’s also significantly cheaper than the P100D. 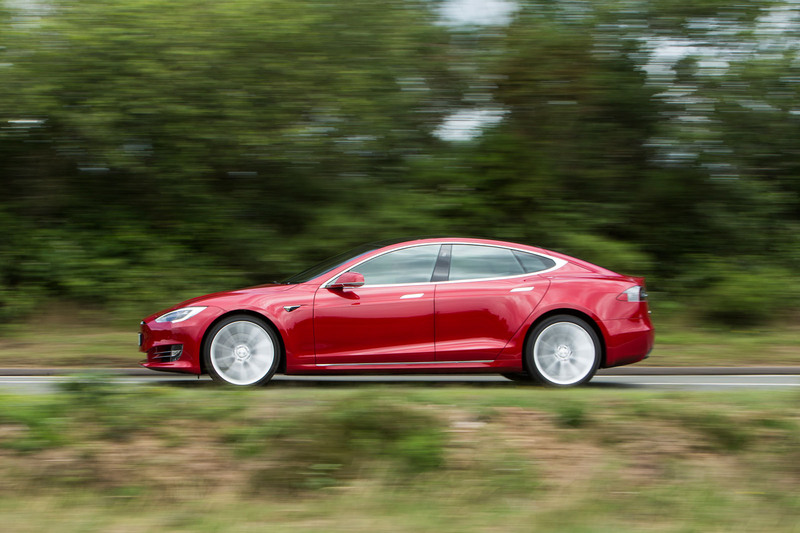 You’ll like this: it’s almost exactly the same as a regular Model S, just with more range. Now as usual, that headline-grabbing figure of 393 miles is a little optimistic for real-world use, but 320 miles should be comfortably achievable if you reign in your right foot. And 320 miles is a long way – it’s enough to get you from London to Birmingham and back with range to spare. In a single bound from the capital, you’d get as far as Sunderland before needing to pull over. And thanks to Tesla’s clever infotainment system, the sat-nav can re-route you to the nearest charging point along your destination, and even tell you how many bays are free. Despite being a full 2.0sec slower from 0-62mph than the P100D, this 100D model still feels fast. Prod the throttle out of roundabouts or corners and the instant surge is thrilling, and overtaking is no trouble at all. 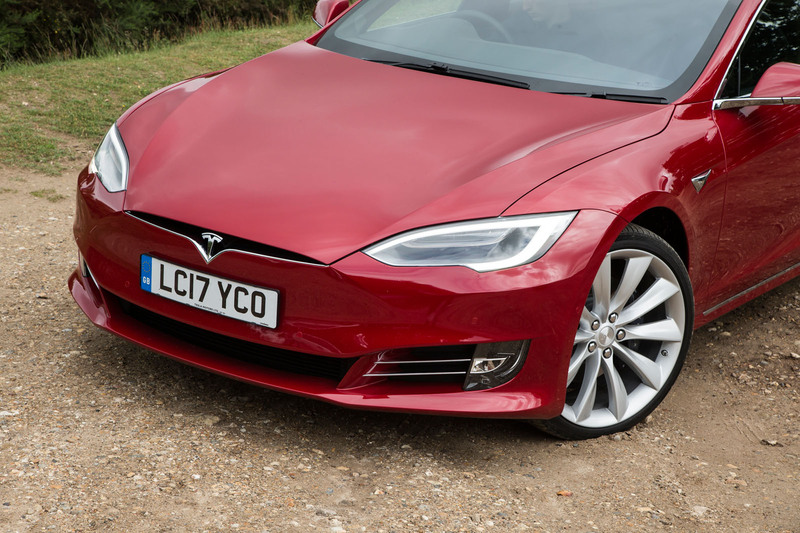 Granted, it doesn’t feel as involving to drive as other sports saloons from the likes of BMW and Mercedes-Benz, but the Model S never feels unstable, although you do feel more bumps in the road than in its rivals. Inside, it’s much the same as before, too. There’s a new panoramic roof which lets more light in, but aside from that, it’s unchanged. 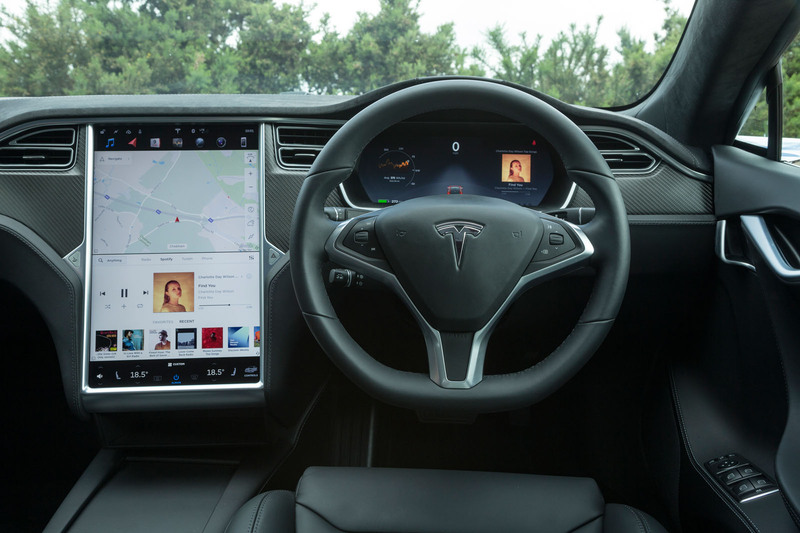 Of course that means Tesla’s hallmark 17.0in touchscreen infotainment screen features, too, and while it takes some getting used to, it’s beautifully designed and offers a huge array of functions. Our only gripe is even with the brightness turned down, it’s still a little dazzling at night. Interior quality is also a little off the mark for a car in this price bracket. If range anxiety is the biggest barrier to your taking the plunge into electic motoring right now, then absolutely. This Model S can travel further than just about any other electric car on sale, and in doing so removes fear of running out of fuel. Even when you do put your foot down, the drop in range is minuscule. Plus, having charged your car at home first, there's still Tesla's Supercharger network to get you where you need to go, and smaller destination chargers to keep you topped up when you get there. Yet there’s a but here, and it’s the price. At £90,000, the Model S just doesn’t feel as luxurious as it should. It feels special, make no mistake, but it's just not as cosseting as the luxury saloons it’ll be going up against. More than any other car I'd like this one for a years loan period. 300 miles, haven't done anything like that in over 3 years and if I had to I'd take our second family car, most families that can afford a £90,000 usually have 2 cars. 300 miles needs to be available for lot less than 90th. An electric vehicle priced around 30K capable of that kind of range could transform the car market. The new Chevrolet Bolt / Opel Ampera is not far off that. Of course, stupid GM haven't made an RHD version of it but hey ho. If you need to do more than 300miles in one go regularly, tis not the car for you. If you want to do occasional trips longer than 300miles in one go, rent a car or plan the trip. Regrettably Autocar appears to have some kind of a policy not to give 5 star verdicts to any cars other than Volkswagen. If that is the case then we'll have to wait a little bit longer until VW puts an electric car on road for an electric car to score 5 stars. Nevertheless Tesla deserves a 5 star verdict for an electric car with a 400 mile range and enough oomph to smoke any Porsche Panamera - feat performed only in VW press statements. And over all Tesla deserves 5 stars for making electric cars so cool that orthodox companies like VW are pining to join the EV bandwagon. Watched a program on Sunday on BBC2. Paul Hollywood was in Paris France,in the City they have 4,000 small electric Cars which like a Boris Bike in London you can use and leave at your destination,these Cars in Paris have cut congestion in the City by the equivalent of 40,000 Cars!,yes that's right 40,000 Cars less polluting the City,there is no range anxiety,it's cheaper and a useful reduction in harmful gases,and where are we in Britain with this idea? That huge screen is just appalling. It is so wide that the driver's air vent is positioned behind the steering wheel, where all it will do is provide air to the back of the driver's left hand. The screen also has so much going on I do not know how anybody can think this is safe as the driver will have to spend ages casting his eyes around at it trying to find what he wants rather than looking at the road. If Tesla had to make a profit and build in volume, like real manufacturers do, it would be even more absurdly expensive. £90K buys you a 540i, and enough change left over for another 540i in a different colour, if you wanted. The £131,800 model could buy you a nice E or S Class and a house in Spain to drive it to and from. Emperor's new clothes, etc, but since the only reason this car exists is because it's an EV, take a good look at the rest of the package. Powertrain aside, it's a bland, derivative design with little merit and questionable cabin ergonomics. If the badge said Hyundai, it wouldn't be surprising. But that powertrain makes it worth a 300% premium, right? I think it is now clear what happened after the collapse of the Berlin wall re the staff from Trabant. They are now all in the USA building vinyl covered cardboard interiors for Tesla. This has to be one of the nastiest interiors since the days of the Skoda Estelle. I would rather pay 90k for a vauxhaul than one of these.